Dr. Cousineau is board certified and a member of the American College of Obstetrics and Gynecology. 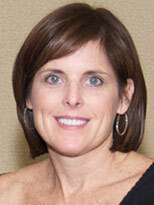 She serves as the managing partner for OBGYN Associates. Dr. Cousineau is an accomplished Davinci robotic surgeon. This minimally invasive approach for surgery greatly reduces her patient's recovery time, in cases of hysterectomies fibroid removal and endometriosis repair. She has recently expanded her office hours by offering appointment times at the Stow office location. In addition to, delivering babies, working with new mothers is a passion of hers. She is equally experienced with women's health, and stays current with medical procedures and advances in women's health issues. Her sophisticated approach to women's health is comprehensive; offering advice on wellness and fitness as well as sound clinically proven methods for post menopausal care and women's general health. Dr. Cousineau completed her undergraduate education at Bowling Green State University, and received her medical degree from Ohio University College of Osteopathic Medicine. She completed her Ob/Gyn training at Akron City Hospital. Dr. Cousineau is a native of Akron and promotes Akron area businesses. She is the senior partner of OBGYN Associates joining the group in 1997. She actively serves on hospital executive committees. She is a member of the teaching faculty at both Akron City Hospital and Akron General Medical Center. She also gives of her time to the Adolescent Clinic at Akron Children's Hospital. She is married to former Cleveland Browns/Ohio State football player, Tom Cousineau; both contribute their time and give generously to the Akron community they love. She spends her time with her two daughters, enjoying fitness, tennis, boating, snow skiing and hiking. high & low risk obstetrics.